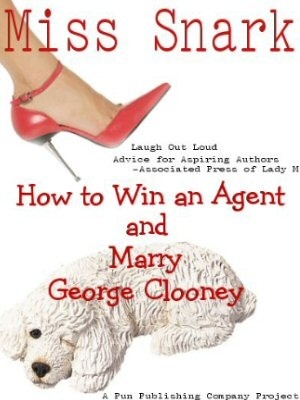 Miss Snark, the literary agent: News Flash! Agents ARE Human Beings! I'm registered for a five-minute pitch session at an upcoming writers conference and I'm trying to prepare rather than simply panic. What are the types of things that an editor might be interested in hearing from me? I've memorized the fifty-word pitch for my PI mystery, the highlights/conflicts of the story, and my publishing credentials/honors. I know why I was drawn to my main character and how the events of the book are significant to me. Thanks in advance for sharing any thoughts. First, don't recite your fifty word pitch when you sit down. Second, don't recite it at all. Third, use this time to CONNECT with the agent or editor. If you just sit down, spew lines and then sit there, I'm not sure who is more uncomfortable: you, me, or Killer Yapp confined to Miss Snark's Prada handbag. You: Good morning. Thanks for seeing me. MS: Good morning, it's my pleasure. MS: (puffing up with delight at being asked to share her pearls of wisdom) Sure, go ahead. What did you like best about (insert name of book editor worked on or agent sold)? Do you like to be hands on with your author? What do you think of trade paperback originals for debut authors? THEN you ask if you can pitch. (Even if you don't pitch, you can then write a query letter referencing your really nice conversation at the conference plus you’ll have a much better idea of what the agent/editor looks for and likes in books). You can pitch any agent or editor in the world in a query letter. What you have at this conference is an opportunity to make a person to person connection. Do not SQUANDER that chance by being nervous, or treating the agent like the judge at an audition. TALK to the agent. Get him/her to talk back. We're human beings (ok, most of us are sometimes). We like to be asked our opinions, we like to be told we're fabulous. Miss Snark attended a cocktail party recently wherein several desperate souls accosted her at the bar and began pitching their work. They actually asked Miss Snark to take pages then and there. Miss Snark gave them her mailing address for nitwits (101 Staten Island Landfill Road). Miss Snark subsequently enjoyed a hilarious conversation with two delightful women who never ONCE mentioned they were writers. They didn't have to. Miss Snark was at an event for writers and agents: she knew everyone who wasn't an agent was a writer. The conversation was charming. Miss Snark was glad to give these two savvy women her card with address, phone and email on it. Why? They'd demonstrated they would be fun to work with and knowledgeable about how to behave well. They were FUN to talk to. Their work will get read. Those others won't. At the conference, just relax. Think of it as a way to meet interesting new people who like to read as much as you do. Coming out of lurkdom to add my thanks. Your entire blog is an invaluable reference. Your Snarkiness, this is good stuff for anxious writers attending conferences or other professional/social events that include agents to consider--not only because it plays (or, as you would put it, "sux")up to the agent through lavishing attention rather than vomiting their pitch on her--but more importantly, because it is counter-intuitive to the mentality with which most would approach a pitch session. I'm printing this one to put in my folder for going to conferences....diamond studded advice! Thanks Miss Snark! Oh, btw, Miss Snark, What Do you think of trade paperback originals for debut authors? Great advice. Before launching into the 30 second pitch, I talked to the agent and learned we'd lived in the same city as kids, that our parents both worked for the city government. Not only did she ask for the full, she did what agents rarely do at pitch sessions - took the hard copy first three chapters I'd brought 'just in case' and asked that I keep quiet about that. In a workshop the next morning, she told me she couldn't wait to read the full. I don't think that would ever have happened without connecting with her as a person first. What if you're in a group pitch situation? Like there's four other authors sitting there with you and the agent? I know that happens at RWA's national conference, and I'm curious as to how you would recommend we handle it in a group situation where everyone else is pitching. The best advice on pitch sessions I've ever heard. Thanks! Thanks for the advice Miss Snark. I’ve been on the fence about attending an upcoming writers conference. You’ve inspired me. I’m mailing the check today. I've seen a lot of articles on this subject about creating a pitch to attract an agent -- although now the thought of laying out a tumbler of G&T in front of the hotel bar comes to mind -- but nothing like this. Miss Snark, How many martinis does one need to ply you with before you fork over your business card? But will you respect me in the morning? If it is a good morning … which I doubt. I'll buy the first round. Dear Mr ExMan: "The only problem I have is the lack of clean gin pails and filled ice trays at 7:51pm on a Friday night". Dear M/M Dashwood: The perfect number of martinis is also the perfect number of breasts. One is too few; three is too many. I observe that rule religiously. Now, let me teeter back to the bar. You're absolutely right. Fabulous advice. I went to a writer's conference this weekend, and I had an appt. with an editor. While I did pitch my book, we brainstormed about how to make it a bit more plausible in one part, and it was a great opportunity to get her advice on how to make my novel better. I'm glad I had the chance to have a face-to-face!